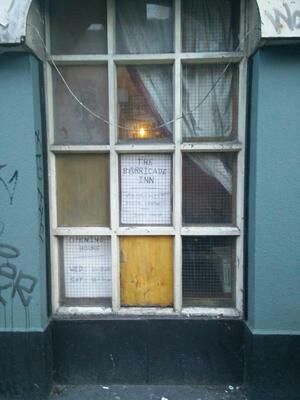 The Barricade Inn, Parnell Street. 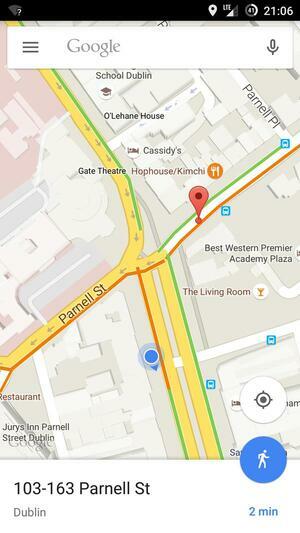 Posted in Misc and tagged Barricade Lounge, Parnell Street at 8:19 am on May 14, 2015 by Broadsheet. I am just happy to see young writers using skuf coat etc.. in place of the usual over priced krink etc.. In the heart of Dublin, a new collective has occupied an old building, previously known as Neary’s hotel, to create a new radical, autonomous social centre and infoshop for our city. A few hundred metres down the road from the Garden of Remembrance — a place many of us know as the starting point for marches and demos protesting the injustices and manifestations of oppression and repression perpetuated by the state and the capitalist, white supremacist, patriarchal system that rules over us — we are reclaiming our city and reclaiming power and control over our own lives. Never say “my bad”. Never do that. ….supremacist, patriarchal system that rules over us — we are reclaiming our city and reclaiming power and control over our own lives. If coming please bring milk as Jerry is useless at remembering to get some before the meetings and no one likes black tea…. wait that’s racist…. tea without milk. Oh bring biscuits too, Choclate Digestives is favoured, if you bring Custard Creams or Marietta you can f**k right off. But whatever you do, don’t wish for a white Christmas, out loud. I sense the tweeter already knew. He’s a guy who knows exactly how to use social media to the full. Beginners’ French classes? Aux armes, cityoens! “A radical, autonomous social centre and infoshop in Dublin”. Also that HopHouse place is brilliant. Go there. their bibim bap is the best in Dublin. All of it good, so so good. Was that the old “The Welcome Inn”? I love the signage on Neary’s. I’m all for a bit of anarchy and shaking up the system, otherwise we’d all be like chicken in cages laying eggs for someone else. But I bet they are incredibly disorganised and attracting 24/7 dope smokers who constantly forget to get up in the morning. They don’t forget. They sleep longer than they’d intended. already looking forward to live streaming the eviction. Who is providing LTE in Ireland? I bet they draw dole…but i suppose that is “mutual aid”????? Oh all these “I bet” comments are just hilaaarious. You have no idea but you feel the need to pour badly-informed scorn on them anyway. I am peripherally involved with the Okupa movement in the city where I live. They offer English classes, sign-language classes, legal aid, dance classes, free concerts, mediation for immigrants, bike repair workshops, food banks, radio/press and many, many other services … all free or in return for donations. They are a lifeline to people struggling against cutbacks to social services, unemployment, poverty and discrimination. They are welcoming and inclusive and the bars/cafés offer a cheap alternative to people who cannot afford ordinary bars. They provide a forum for alternative/non-mainstream debate. All this in the face of threats and aggression from the police and authorities, though they have the almost unanimous support of their neighbours. But yeah, they get snarky comments about dolies and dope smokers and crusties and all the rest. It’s boring, it’s stupid, it’s unoriginal, it’s not big and its’s not clever. A bit of information and an open mind would serve them and us all a lot better. 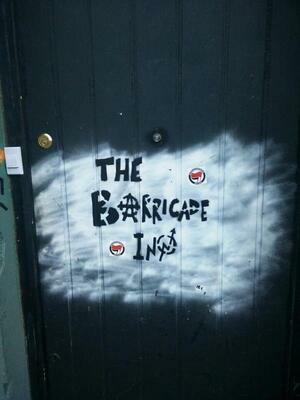 All my best to the Barricade Inn and the libertarian movement in Ireland. The contradiction of living from state money and being an anarchist is unacceptable. If they are living on contributions from donors or trading (damn capitalists) more power to them, but otherwise it is not self sufficient and therefore unsustainable as an idea as the very state they wish to abolish is supporting them.